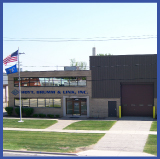 Together three men, Joseph Hoyt, Robert Brumm & Arthur Link, envisioned a mechanical contracting firm with a strong focus on fabrication. The fabrication concept was developed in order to control labor costs and consistently deliver high quality systems that exceed customer expectations. The piping fabrication was simple at first, working from the tradesmen's hand sketches. The concept expanded quickly within our growing organization. Our engineering department was created in order to expedite the mechanical scope of work and allow for improved coordination and overall project control. challenges of customer satisfaction now and in the future.